Currently one of Amazons #1 best sellers, this book will rock your beliefs about fear, security and taking risks. 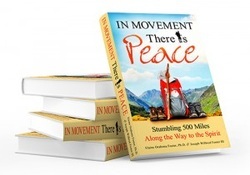 "In Movement There is Peace" is a powerful tale of travel, adventure and unexpected faith. It begins with a doctor who walks away from her practice in order to cure her own paralyzing anxiety. Once free, she discovers that leaving is really only fleeing if there's no new direction. Could this be the reason for her husband's sudden inspiration? "I want us to walk the Camino de Santiago, it's an 800 kilometer pilgrimage across Spain." After deliberating the wisdom of walking 500 miles with no planning or physical conditioning and little religious faith, the two set off to walk the "Way of Saint James." Their "no-plan" plan sets off a series of extraordinary events that can only be explained as divine intervention. It starts with an enigmatic suggestion from a former pilgrim who sends them off with a caution: "There are no coincidences on the Camino." If you've ever doubted yourself or your abilities, read this book. Why did you write this book? How did the impulse come about? Joe: Elaine and I had never written a book like this before. We are… no, we were very private and tended to avoid exposing ourselves to other people we didn’t know. The Camino de Santiago changed that. It changed us. We didn;t realize it at the time but going on pilgrimage required exposure; it made us vulnerable to the environment and the people around us in a real, physical sense. We learned a lot along the way to Santiago, from all the hardships and from talking with people from so many different places. Even from having to listen to our own thoughts, day after day for 500 miles. The book almost wrote itself. We journaled a lot, not because it was out of some habit we’d already started. It was something that we were just driven to do. We had so many new thoughts and experiences. We had to write them down if simply for fear of forgetting them. When we were done journaling about the adventure I was amazed at how much we’d written. Who is your intended audience, and what does the book offer the reader? Elaine: There are a lot of good books out there on the Camino and I didn’t feel there was a need for another “travel guide”. We tried to focus more on the internal struggles we all go through in life. In our book, we talked a lot about relationships and family, and about the fears and anxieties that keep us from living full lives. I think the story of walking 40 days across northern Spain is what keeps the reader engaged but the story of the internal journey is what the reader walks away with. Everyone can identify with the many pains and struggles we experienced during the journey and it's easy to see how we can apply the lessons we learned from them in our everyday lives. Tell us why this book is so important to you both. Joe: We're both caregivers by nature. We like helping others and get a huge feeling of satisfaction when people write to us about how much they've learned from the book. They’ll share their own thoughts and experiences with me and I just love it. We’ve sold thousands of books and each time I see that another one has sold, I picture it sitting on someone’s bedside stand waiting for them to explore their own Camino. I picture someone reading a page and nodding in agreement because they've lived through similar experiences. Elaine: This book is my reminder that when I take chances and break away from my desire for comfort and security, life is waiting on an unfamiliar path with lessons I would never learn by staying home. What impact did the process of re-living the Camino through your writing have on both of you? Elaine: I knew what I felt when it happened, but writing for the purpose of helping others who suffer silently with anxiety like I did was surprisingly liberating for me. I always felt ashamed of how limited I was by my own anxiety despite making my living as a psychologist. Writing the book was like admitting I was weak and learning that people didn’t think less of me for it. The people with anxiety who read it seemed glad for the discovery that they are not alone and that even mental health professionals suffer with the same battles. Joe: For me, writing the book really helped to set the lessons I'd learned along the Way. I'm a pretty, "be in the moment" type of person, which I know a lot of people might admire but there's a downside. The journey could of easily slipped away into my past. I'd experienced so much, learned so much about myself, about Elaine and others. Going through the process of documenting it, with Elaine and I having long, deep discussions about so many aspects of the journey, I absorbed the lessons much more fully. What is different now, how does the world look and feel now that you have walked as opposed to what you saw and felt before you walked? Joe: Wow, that’s so hard to say. We change every day of our lives. Most of the time those changes are so small, you don’t notice them. Other time’s they’re huge. The Camino was huge. I have a different view of the world now and how we each have a role in it. I think I’m a lot more aware of my surroundings and more relaxed when things don't go quite as planned. The title of that popular book pops into my head, “Don’t Sweat The Small Stuff”. I’m a lot less likely to sweat the small stuff. Elaine: I learned that there are no coincidences in life, not just on the Camino. When things don’t go as planned, I learned to let go of my desire to control things. Now, I assume that God has a much better plan than anything I can think up. I used to worry about everything. Nothing was too big or too small for me to obsess about. Since the Camino, I know I can have a greater impact by my actions than my worries. I ask myself, "What is the right thing to do in this situation?" Then I set about doing it. Everything else, the stuff I can’t control or don’t understand, it just doesn’t bother me anymore because I’ve seen how things work out if I just stay faithful and believe that things happen with a greater purpose than my individual desires. Joe, you are a seasoned hiker. How did this Camino differ from the other tough hikes you took? What is it that the Camino has to offer in comparison with other more challenging hikes? Joe: That’s simple. The Camino is so much more of a spiritual and emotional journey than a physical one. If you take a realistic look at the physical part of the Camino, at each individual step, it’s not that difficult. The physical challenge is in how you approach the pilgrimage, especially for Americans. We are very goal-oriented people. We have schedules, we make plans and we push ourselves to meet those expectations. Elaine and I learned the hard way how important it is to let go, to listen to our bodies and to take one step at a time, literally. That is such a valuable lesson to learn in life. When we started out on our journey I was focused mostly on the destination. Along the Way, I learned that there has to be a balance between the journey and the destination. Elaine, we learned about your anxiety disorders. Please summarize how the Camino helped you go to the root of your fears. What has changed? Elaine: The simplest way I can put it, is the Camino exposed me to the world I had been avoiding for so many years. It was easy to tell other people how to treat their anxiety while I sat behind my desk writing prescriptions. The Camino compelled me to confront my fear of flying, of meeting new people, crowds, heights, noise, germs… Facing these fears on a pilgrimage allowed me to realize I can make peace with them instead of resisting the feelings. The Camino taught me that there are no coincidences in life, there is a plan for all of us if we just learn to listen and use every experience as an opportunity to grow. Now, when I feel anxious, I try to just stay in the present moment instead of projecting about all the “what if’s” (the things that can go wrong). I ask myself, “What do I have control of in this situation?” Once I determine the path that will lead to the greatest good, I take it even if I have to bring my anxiety along with me. I know that I have the strength to work through all kinds of painful experiences. Walking 500 miles proved to me that I have the capacity to witness miracles if I stay open and take one step at a time. What does ‘in movement there is peace’ mean at the deepest level? Joe: For me, it’s a reminder that world is constantly in motion, constantly changing. By accepting change and by embracing the fact that our lives here on earth are finite, my fears tend to slip away. Walking the Camino was an exercise in remembering that we are living physical, emotional and spiritual beings. Elaine: The title was a way to remind me that we have this false belief that staying indoors, in the security of our homes, behind our fences or locked doors with our televisions, computers, and alarm systems is the best way to feel secure—to be at peace. I would watch the news about crimes and murders and ask myself, “why go out into that dangerous, threatening world when I have everything I need right here at home?” Walking the Camino gave me joy I never thought was possible. The act of moving every single day brought new sights, new people and it made my mind and body stronger than ever before. It brought peace of mind and body. What to you is ‘the call’ to the camino? Elaine: In my mind, the call to the Camino is a call to test your limits of endurance, your understanding of the world and your relationship with God. In the book, I say that I was never very committed to any faith. If anything, I believed in the Holy Spirit because of its universality. But even then, when I saw suffering in the world, it was hard to believe there was any entity that really cared about us. Walking the Camino exposed me to a community of seekers. They were seeking understanding, growth…fellowship. Many of them had experienced death, divorce, retirement, major life changes that attracted them to the Camino as a type of mental or spiritual cleansing. That is the call to the Camino in my mind: it’s the pull toward a new way of life. Joe: I love traveling and going on adventures. When I found out about the Camino and watched the movie “The Way” I knew I had to go. I’d lost my father several years ago. He’d had triple bypass surgery and afterwards had decided to live a healthier life by backpacking portions of the Appalachian trail. My mom was worried and not at all happy with his decision, so I promised to accompany him every year as a kind of added insurance for his safe return. On the third year of our hike, I backed out of the trip at the last minute and Dad decided to go on his own. He was up in North Carolina when he stepped out onto the trail. He was found two hours later, he’d died of a heart attack. The guilt I’d carried because of my decision not to go with him hung over me ever since. The Camino was an act of forgiveness to myself. You talk about pilgrimages being an act of surrender. What does surrender mean to you? Elaine: It’s ironic that my first act of surrender on the Camino was to give up my resistance to leaving my familiar life behind. I decided to trust that Joe would know what to do because I certainly had never done anything like that before. But there came a time during the journey when I had to pull away from Joe and surrender my needs to a higher power. It didn’t matter what my body was telling me. I even had to block out my own thoughts begging me to give up. All that mattered was the promise I had made to God. It seems to me that life is always more satisfying when we are willing to sacrifice for a higher purpose. A pilgrimage is real-world proof of it. Joe: For me, It means surrendering to your true self. It’s about making yourself vulnerable, to the physical environment and to the people you learn to rely on along the way. I'm a very experienced outdoorsman and I'd expected to rely on that experience to guide me. The Camino didn't care that that I was experienced, in fact it probably worked against me. That's what I had to let go of, what I had to surrender. Like I said earlier, it was so much more than a physical journey. In your book you say, ‘A pilgrimage is an act of surrender, through faith, of one’s own comfort and desires.’ How is a pilgrimage different from everyday life, considering that many of us go through hardships in which we have to surrender our comforts and desires? Elaine: If you're surrendering your comforts and desires in everyday life as an act of surrender through faith, then in my humble opinion, your life is a pilgrimage. I know many would disagree with that statement, and I am no theologian so you are only getting my take on a complicated subject. At the same time, a physical pilgrimage to a holy place like Santiago, Rome or Jerusalem brings you in physical contact with other pilgrims along a sacred path. In addition, your feet are treading along the same earth as those seekers who walked it centuries ago, each with a special hope and intention. The experience of merging your spirit with theirs is really indescribable until you’ve done it—struggle and all. Joe: You’re right, we all go through hardships. Sometimes they are forced upon us and sometimes they happen because we chose a difficult path. During a pilgrimage you learn how to deal with hardships, how to let go of your expectations and focus on the moment. I practiced letting go every day for 40 days. Letting go of my guilt surrounding my father’s death, letting go of my daily goals and expectations and letting go of my comfort seeking. If the Camino journey is a metaphor for everything that we are inside (meaning that if people and events are reflections of who we are); if it is a way for us to confront the truth of our nature, what would you say was the best and worst confrontations with yourselves were? Joe: I think the best part of me came out after we’d spent a long day on the trail and I was completely exhausted. We’d sit down at a small cafe, order a meal and a glass of wine and just watch the world go by. It was there that I was completely at peace. I was in the moment. The absolute worst was watching Elaine suffer everyday. Her foot pain, her father’s illness and her daily battle with anxiety. I felt so helpless not being able to “fix things” the way us men tend to want to do. Because of that frustration, I'd sometimes get angry and just want to quit. It's funny though, it was at those times that I'd learn the most about myself. I'd see how I was reacting and change my behavior. I had to learn to let go and just accept that some things just can't be fixed. Elaine: My best and worst confrontation with myself was when I slumped down to the ground in sheer defeat just before arriving at Herrerias. I believed what my mind was telling me-- that I was a failure. But sitting there next to Joe, knowing he wouldn’t give up on me, it allowed me to realize I was setting an unrealistic standard. It didn’t matter how long it took. I could take all the time I needed to accomplish my goal. I was finally able to understand the meaning of the saying, “You can’t beat a person who never gives up.” Standing up to my own fear of inadequacy on the Camino was a metaphor for taking risks and believing in myself back home. Why do you feel that people open up to each other on the Camino in a way that they do not in every day life? Joe: On the Camino we soon learned that we were all on the same journey and needed each other for support, either physically or emotionally. I’ve sat down and bandaged a stranger’s foot in the middle of a field. I’ve let a poor farmer open his home to us, to feed us and put a roof over our head and I'd fought the urge to “pay him back” because I’d finally learned that these are gifts of love. We learned to let go of self reliance and to let others carry our burden from time to time as we were so readily willing to carry theirs. It’s difficult to directly answer you question “why” because it just happens. This is what humans do when given the chance, we open our lives to each other. Elaine: I think it’s because we are in a type of “boot camp” scenario. We are each looking at the long obstacle course ahead and realizing we are in it together. We know we can go farther and have a better chance of making it if we can rely on one another. We build trust by sharing and it makes the miles fly by. One other thing, when we share our lives with people from other countries and discover we really aren’t very different from each other, it reinforces our desire to do more of it. How do you now approach strangers after your Camino journey? What quality of the heart has shifted in both of you? Joe: I find it much easier to start conversations with strangers. I’m less worried about what people think about me and more interested in how other people are doing, what’s going on in their lives. I’ve found myself noticing an expression on a strangers face and just go up to them and ask, “Are you alright? You look sad.” I find myself taking those extra steps to engage with people, like going up to a women unloading her grocery cart into her car and saying, “Here, I’ll take that back for you.” I never used to do that before, thinking I’d be bothering them or stepping into their personal space. Elaine: It’s still a battle for me to initiate contact with new people. It doesn’t come naturally. But, I don’t avoid it now. I accept it will probably always be hard for me, but that’s not a reason not to do it. I’m always glad after I’ve pushed myself to take a chance. Of all the meaningful experiences that you share in the book, which one has had the most impact on you both? Joe: The most significant experience I had on the Camino was in my relationship with Elaine. The Camino brings out the best and the worst in us. I watched Elaine suffer physically and emotionally. It was so painful to watch but it brought out the best in both of us. The way she dealt with her pain, with her fathers illness... the way she dealt with her fears and anxieties was absolutely transcendental for me. I learned so much from it. Elaine: Dan’s advice had the most impact on me. He said “There are no coincidences on the Camino. People are on the path to teach you and you are there to teach them.” That advice guided every step I took on our journey and it colored every experience from the very first day. What advice do you have for those about to embark on their first Camino journey? Elaine: Set an intention before you go: to learn, to take meaningful risks, to break out of the familiar—whatever is important to you in your growth. Remind yourself of that intention every day no matter what happens along the Way.